Here is a photo of the first set of sliding dropouts. 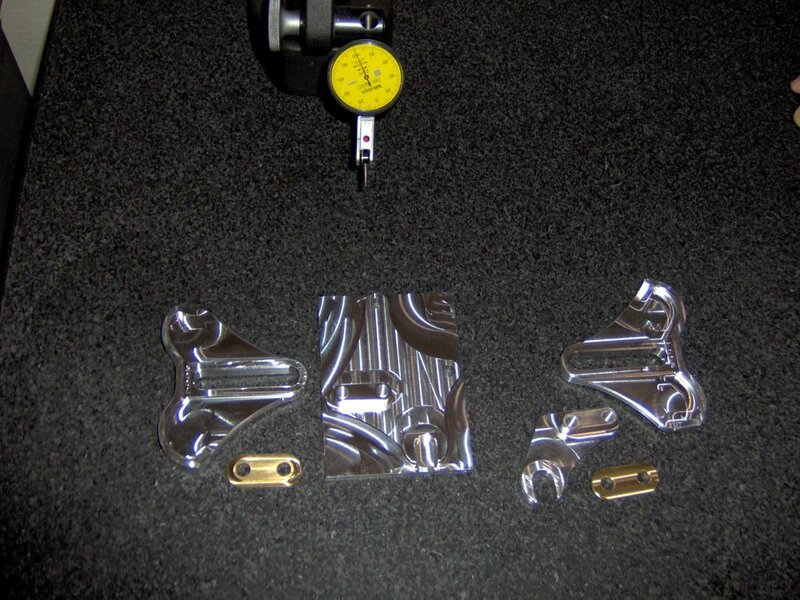 The main dropout body is machined from 7005 aluminum, the sliders are 6061 aluminum and the stepped washers (aka wear guides) are brass....all CNC machined in the Bay Area. In the center of the photo is the sliding disc tab still embedded in aluminum billet; it's not quite finished with machining yet but you can see the final part taking shape. These parts will be tumble-deburred and bead blasted for a smooth surface finish...stay tuned for higher quality photos of the complete assembly. I'm also having (2) aluminum 'mask inserts' fabricated which will close the dropout slot completely during the powdercoat process -- don't want any paint on the inside sliding surfaces!